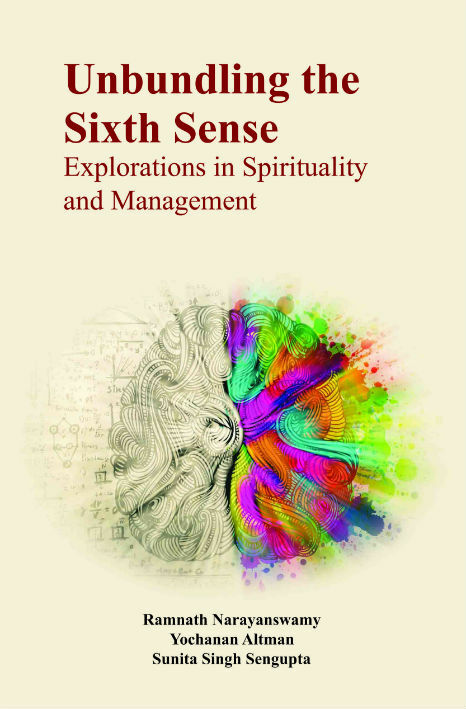 Bengaluru: The book ‘Unbundling the Sixth Sense: Explorations in Spirituality and Management’, co-edited by Professor Ramnath Narayanswamy from the Economics & Social Sciences area of IIMB, will be launched at IIM Bangalore on March 16 (Friday), 2018. The co-editors of the book, published recently by Sampada Publications, are Professor Yochanan Altman and Professor Sunita Singh Sengupta. Professor G. Raghuram, Director, IIM Bangalore will speak on the occasion. Other guests include Prakash Belawadi, noted film actor and theatre director; Kala Devi, Chief Manager – HR and Regional Head South, Times Foundation at Bennett Coleman and Co. Ltd. (Times Group), and Sharat Hegde, Director, Heartfulness Institute. About the book: The collection of writings on spirituality and management in the book offers a unique in depth insight into the link between spirituality and management in a cross-cultural context. With authors hailing from across Asia, Europe and the United States of America and dealing with a range of topics from workplace spirituality and corporate leadership to business education and individual accounts of spiritual journeys, this compendium offers a spectrum of views, ideas and approaches towards imagining and practicing spirituality in management. Chapters of this book present current debates on spirituality and links with the workplace, employee engagement, leadership and organizational sustainability. Concepts such as ‘spiritual leadership’ are explored to gain insight into blind spots that leaders should address in managerial capacity and organizational space. Experiential accounts of spiritual journeys and transformation are recounted. The perceived conflict between rational, moral and spiritual approaches to life and to leadership are fleshed out. Attempts to integrate western and Indian views of workplace spirituality as well as to understand the ancient roots of modern business practices in India are made in order to develop robust paths towards organizational sustainability. As a panoply of ideas and approaches towards imagining and practicing spirituality in management, this collection also explores the ‘how’ part of setting objectives, going about obtaining these objectives, and harnessing suitable resources in the process – physical, monetary and human. This collection follows an international conference on ‘Indigenous Models of Sustainability, Good Governance and Spiritual Transformation’ hosted by IIM Bangalore in collaboration with the Vedic Foundations of Indian Management in New Delhi; and the International Association of Management, Spirituality & Religion, which took place in January, 2016. Submissions were encouraged from practitioners, academia as well as doctoral scholars. The book will be available at Sapna Book House in all its branches (14 branches in Karnataka and two in Coimbatore), the campus bookshop at IIMB and Indian Institute of Science, Bangalore and other leading stores. Online purchase can be done through Amazon and Flipkart.